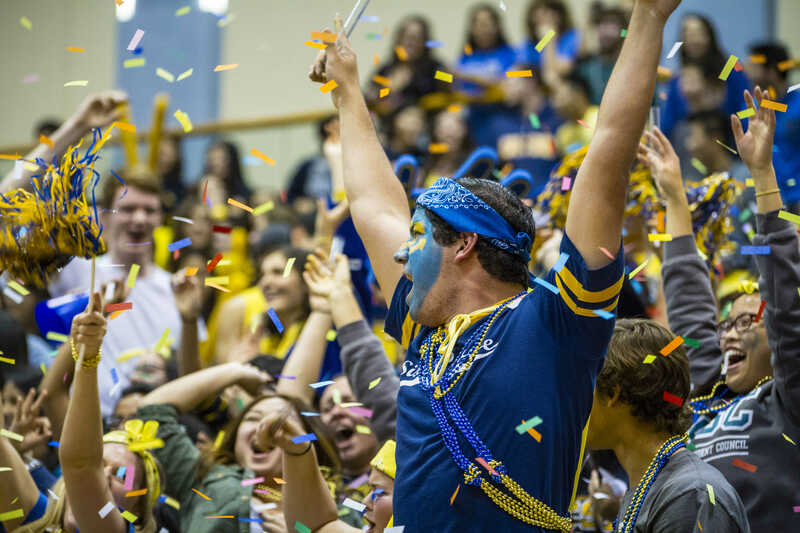 After recording the second-highest attendance in RIMAC Arena history last year, 2015’s Spirit Night held this Friday will look to be another thrilling and raucous evening of basketball. While both the men and women’s basketball squads have had had a strong year thus far, Friday’s games will mark the beginning of the second half of their seasons and could have serious playoff implications. Take a look at the UCSD Guardian’s previews of both conference matchups for what should be an entertaining blue and gold night. Entering Friday night just one game back of a three-way tie for first place in the California Collegiate Athletic Association, the Triton men (10–6, 8–4 in conference) are looking to make a big leap in standings as they face 11th-ranked Cal State East Bay (2–10) on Friday night and ninth-ranked Cal State Monterey Bay (5–7) on Saturday evening. While the UCSD men’s basketball is coming off a loss from last Saturday, the Tritons were on a dominant, six-game winning streak immediately before, tying the school record since becoming a Division-II program in the 2000–01 season. The recent, hot streak is indicative of an exceptional season thus far for a team that was pegged to finish ninth early in the season. UCSD has truly relied on an ensemble cast, as opposed to the efforts of a single superstar for this year’s success. As a team, the Tritons sit just behind Humboldt State for the title of most three-pointers in the league thus far in 2015. Additionally, UCSD has turned the ball over fewer times than any other school in the conference, averaging just 10.9 turnovers per game. The Tritons have also been solid defensively, as they held their opponents to just 54 points per game during their recent winning tear. At 4–14 overall and 2–10 in the CCAA, Cal State East Bay may present little to no contest for the Tritons who are 9–4 all time in the two squads’ previous matchups. Cal State Monterey Bay and UCSD are tied at 11–11 all time, however, and the Tritons have a great opportunity to tip the scale in their favor at RIMAC after having lost their earlier meeting this season by a narrow 64–62 score. After finishing seventh in the CCAA last year, one spot short of the six-team postseason cutoff, UCSD is looking toward an unlikely year of redemption and will get an opportunity to showcase their skills in front of the season’s most jam-packed crowd on Friday. Both games will commence at 7:30 p.m.
On Spirit Night, the sixth-ranked UCSD women’s basketball team (9–8, 7–5 in California Collegiate Athletic Association) will square off against seventh-ranked Cal State East Bay (11–7 and 6–6 in CCAA) in a game that could have dramatic playoff implications. For now, the Tritons hold the sixth and last qualifying spot in the CCAA, right in front of Friday night’s opponents. UCSD is led by two-time CCAA player of the week junior forward Farrah Shokoor, who leads the conference in rebounding at 12.2 boards per game and is sixth in scoring, with an average of 13.9 points per game. Senior guard Miranda Seto is the other Triton with double figures in scoring at 12.8 points per game. Senior forward McKennan Bertsch and her unreal 68.6-percent shooting leads the league in field goal percentage. A dangerous Cal State East Bay team, who defeated UCSD 74–57 earlier this season in Turlock, features senior guard Stephanie Lopez who leads the league in total scoring and whose 18.4 points per game and 4.4 assists per game are good for second in the league. On Saturday, UCSD will face Cal State Monterey Bay at RIMAC Arena. Cal State Monterey Bay currently holds the 11th spot in the conference (out of 12) with a record of 4–13 and 2–10 in the CCAA. UCSD defeated the Otters earlier this year with a 68–57 victory and will look to reproduce the feat. Just one week after two disappointing losses that dropped them in standings, the Tritons will look to regroup. The team is fully healthy for the first time this year, and this set of two games will test the group’s chemistry and sense of urgency in a tight playoff race. Friday and Saturday’s games will both tip off at 5:30 p.m.